The iPad gets a completely redesigned interface for browsing articles, with a grid format instead of a list, providing better at-a-glance summaries of what your saved articles are about. It’s a big change, but a smart one that adds a lot of value without any real drawbacks. On the iPhone, navigating articles is simplified, with a list view that makes it easier to see at a glance who wrote an article and where it originally came from. Things just look cleaner overall, which makes finding the article you’re looking for much more painless. Reading views have also been updated. On the iPhone, you won’t see the status bar by default, so you’ll get more viewing space. That puts the focus squarely on the content, which is exactly where it should be with Instapaper. Also new to the iPhone is adjustable brightness control. 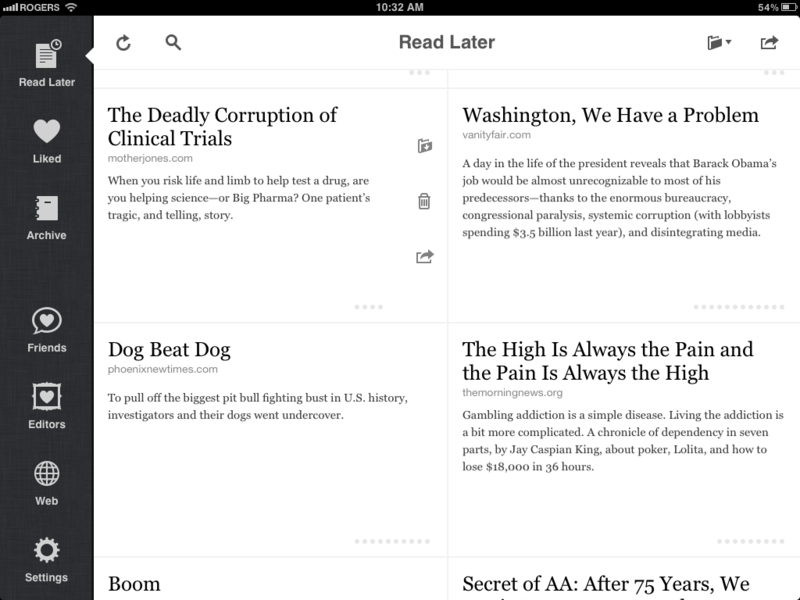 The iPad’s reading view is improved, with better source, author and timestamp information that will also improve with time as the Instapaper service encounters more content. Instapaper has been the source of very few complaints for me, but one thing that always bothered me was the default Archive action when you attempt to remove an article from your Read Later list or other folders. Now, though, there’s a choice to either archive or delete any time the Archive option appears. Swipe left on an article in list or grid view, and you’ll get Archive, Delete or Sharing options. Tap the trash can icon in reading view on the iPad, and you can choose between Archive and Delete commands. Definitions in Wikipedia for any selected text, as well as popover Footnotes for websites that use them are awesome additions, and Multi-select allows you to do bulk actions with articles, like mass deletes or moving between folders. 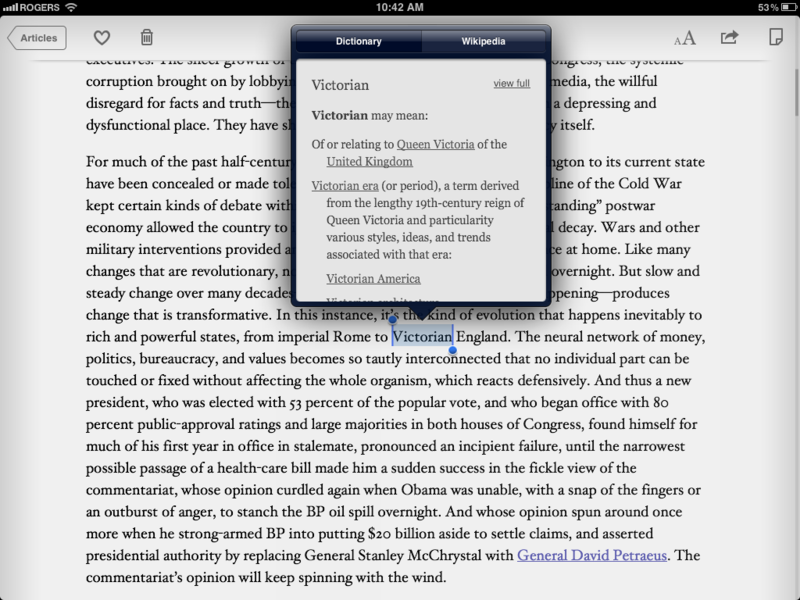 You can also now choose to use Apple’s built-in dictionary to define words if you’re using iOS 5. 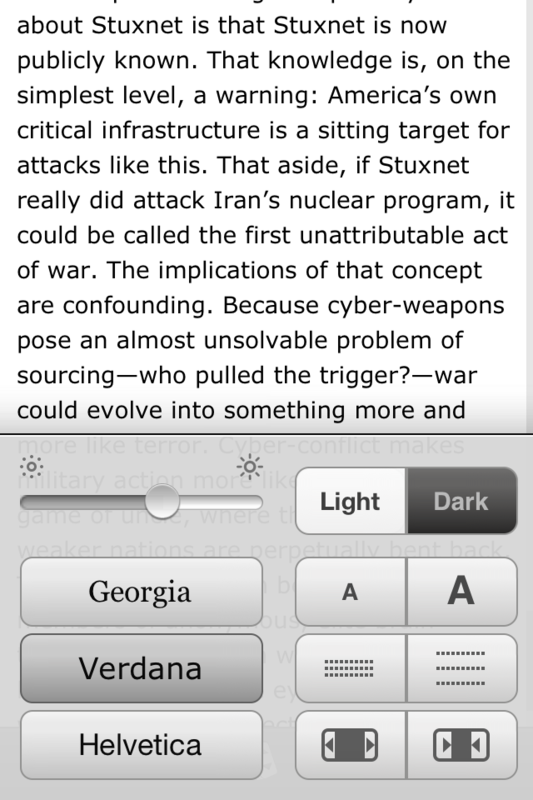 There’s a great new Search function that is included for those on the subscription plan ($1 per month) which searches the full text of any article you’ve saved to Instapaper, and can be accessed from the main screen. This really helps, since it makes finding that one thing you remember reading somewhere that much easier. Those interested in a subscription can now get one via in-app subscriptions, too. I’m particularly happy about the new Editors redesign for discovering articles. You can now get lots of great content from Give Me Something to Read, and that content is accessible faster than in previous incarnations of the app, when it was often slow to load. Immediately, the new Editors section provided me with at least five interesting new articles I’ll be reading later, plus, new social sharing features let you see any and all links posted by your Facebook friends and Twitter contacts, and Tumblr users you follow. This really is a massive update, with lots of little changes that really add up to much more than just the sum of their parts. A new App Directory that lists iPhone and iPad apps with Instapaper integration is very handy, and many performance improvements make the app feel a lot quicker, even when you have a long list to download and you’re starting from scratch, as I was with this update. 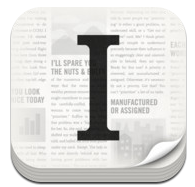 Long story short, if you weren’t an Instapaper user before, now you have no excuse. How does its text extraction compare with Read It Later these days? I switched to RIL because I’ve consistently had more success with the latter. 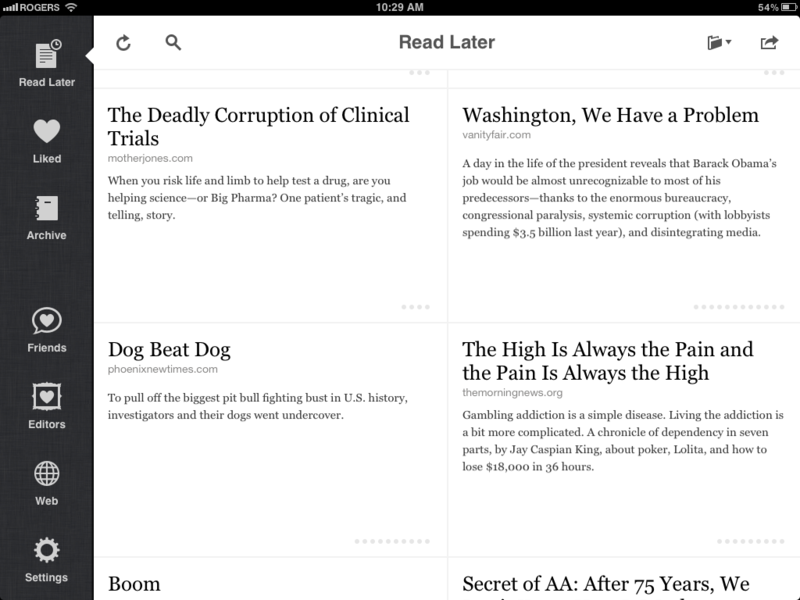 I love Instapaper but don’t like the new vie on iPad. It clutters up my screen with things I don’t want or need. I totally agree. The new interface is confusing and I liked the list view much better. At least there should be an option for which interface to chose. As for the search, basic search functionality was included in the old version for free. This has now been dropped and search is only available for a fee. Again, the basic functionality should have been retained as an option. Thus, as a consequence I went back to version 3. The other changes are minor improvements and don’t compensate for the big letdown on the key aspects of it. Too bad — a big opportunity missed.